As you saw in my story, and as so many of you have experienced for yourself, it’s easy get caught up in the excitement of art journaling – buying all the new products, delving into the infinite possibilities of techniques, and exploring how other people approach their journal. 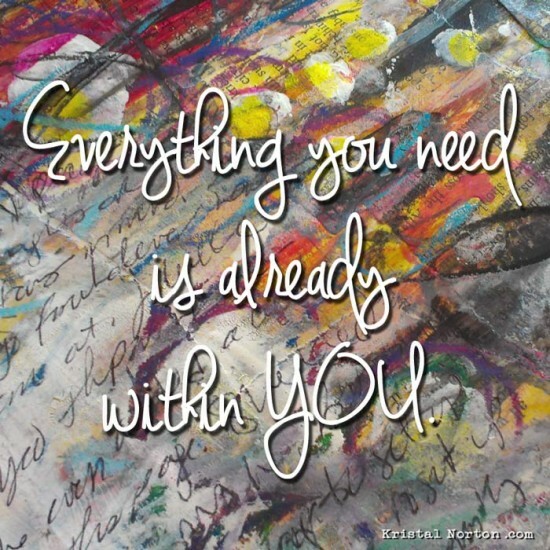 But art journaling doesn’t actually require those things…it’s simply a container, a method, to help you reconnect with yourself. Don’t get me wrong: I also love exploring with new techniques and learning from other artists; but only when I’m looking to expand my artistic skills, not when I’m stuck in my head, worrying about how my journal should look. By looking within for the answers instead of outwardly, you create a safe environment to express a reflection of who you really are. The key is getting clear about your intention. Do you desire a tool to help you dig deeper into your soul? Are you ready to create an art journaling practice that will help you playfully reconnect with your true creative self? If so, then the first step is to shift your mindset when you approach your journal. By bringing out your playful self, looking within, and creating a safe environment for expression, you are building a solid foundation for a transformative art journaling practice that can potentially change your life – which is exactly what I guide women do in my e-course ROOTS. It all begins with that simple shift of how you view your journal, and trusting you already have everything you need. With that shift, you’ll be able to tap into deeper parts of who you truly are. That’s when the magic happens: Your journal becomes a tool for self-discovery. So, what is one belief that you have about your journal that you can shift today to help you view it in a new light? Perhaps it’s a belief that every page has to be beautiful. Or that you have to finish a page when you begin it. Maybe it’s belief about needing the latest supplies before you can start journaling at all. Choose one, and re-write it. Then be sure to share it with us in the comments below. Hi Susan! There’s nothing wrong with wanting to fill every page if that’s your process. :) My comment above about finishing pages, was more along the lines of – don’t pressure yourself to have to finish a whole page in one sitting. And don’t avoid your journal just because you feel you won’t have enough time to complete a whole page. It’s okay to start something, then come back later to finish it. And, it is okay if you don’t want to finish it, and move onto something else. Go with what your heart says, without using “shoulds”. I have a journal, I have all the supplies I need. What’s my problem you ask? LOL It’s the belief in myself, I think mostly. I need to find it in myself to just do it and not worry about anything else. Thanks, Kristal! My obstacle is that I want every page to be beautiful. I want to replace that with the belief that every page should reflect my process–where I am at the moment, what I am working out, what challenges me, remembrances from my past, what delights me, etc. It doesn’t have to be beautiful!! Thanks, Kristal, I see what you mean. I think I’m starting to learn to do that now and go with the flow. Thanks for all your encouragements. I avoid journaling when I can’t think of something different to do. I know it’s ok to repeat images (especially when I like them!) but I “should myself” and spend time worrying about thinking up something different. I have started several pages in my journals – gluing pictures or my background, coloring a page, stenciling – then I just leave them, never going back to add to them. How do I push past this starting point? My belief…is that…I don’t count. I’m scared. I believe that I don’t have a creative cell in my body or soul, and that am wasting time and money only to find that my true self is colorless and washed out. I live in a small very cluttered unorganized apartment. Do you think that could be part of my problem? I am very creative and a writer, but anything that i do is for and about anyone but me. I am bipolar and have ADD, my concentration and focus are horrible and i have no idea of what my hopes and dreams are or how to find them. Maybe my head is as cluttered as my apartment and i can’t find the door to my inner self, who i am etc. For pity’s sake i can’t even figure out what my favorite dessert is, or color, but i do know that it depends on what i’m in the mood for. Why can’t i do this??? ?